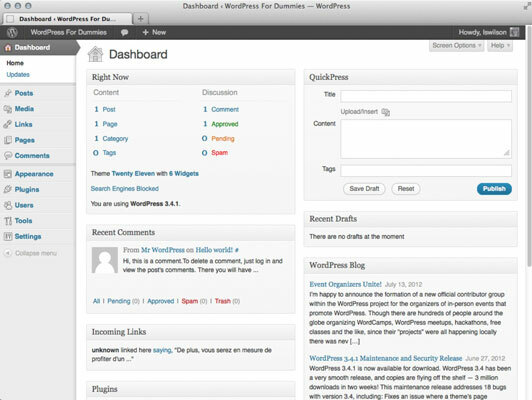 You can consider the Dashboard in WordPress to be a Control Panel of sorts because it offers several quick links and areas that provide information about your blog, starting with the actual Dashboard page. You can change how the WordPress Dashboard looks by changing the order of the modules that appear on it (for example, Right Now and Recent Comments). You can expand (open) and collapse (close) the individual modules by clicking your mouse anywhere within the gray title bar of the module. This feature is really nice because you can use the Dashboard for just those modules that you use regularly. The concept is easy: Keep the modules you use all the time open and close the ones that you use only occasionally — you can open those modules only when you really need them. You save space and can customize your Dashboard to suit your own needs. When you view your Dashboard for the very first time, all the modules appear in the expanded (open) position by default.